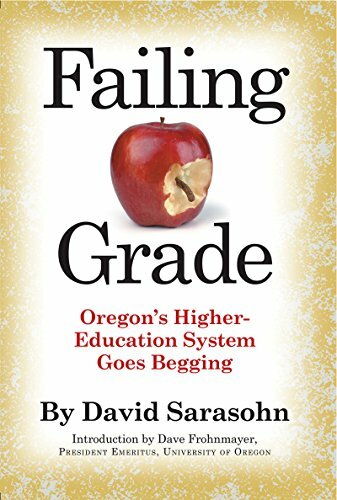 Failing Grade: Oregon’s Higher Education System Goes Begging is a collection of articles by The Oregonian’s chief political columnist David Sarasohn, which appeared in print during a 20-year period from 1990–2010. Nineteen-ninety is no arbitrary year in Oregon political history. It was the year that the highly controversial ballot initiative, Measure 5, passed with 52.4% of the voting public in favor. This measure capped property taxes, transferring primary funding responsibility to the state—a responsibility which, according to Sarasohn, it never lived up to. Compounding matters, again according to the author, is Oregon’s practice of refunding taxes collected above its budget projections back to the public, rather than allocating the money to needy areas, which Sarasohn asserts repeatedly and with conviction is Oregon’s system of higher education. Sarasohn’s acerbic, pointed commentary, drives his points home without leaving any doubt as to his premise. As the state’s population continued to grow, Oregon continued to reduce its support of higher education until it fell to its current low of 44th out of 50 in per pupil allocation ($2,120 below the national average) and 46th out of 50 in average professor salary. Sarasohn carefully chronicles the distinction between Oregon’s policies and that of the neighboring state of Washington, which, during this same period, consistently made efforts to improve its overall capacity to deliver quality post-secondary experiences to its graduates. During this time, many high school graduates left Oregon to attend college in Washington, California, and other states, forcing state universities to rely on out of state tuition to make up the difference. He describes many instances in which students chose out of state private schools because they were cheaper, outlines the average indebtedness of Oregon college grads, shows how the percentage of state residents with a college degree continued to plummet, describes a state in which businesses were forced to recruit from other states, leading to a massive influx of business and political leaders with no Oregon roots. There are many other common themes throughout the book, such as the importance of proximity to a top caliber research institution when businesses decide where to locate, often citing the University of Texas as an example of the positive impact that a quality research university can have on and entire region. He points to dilapidated facilities and the inability of state institutions to attract quality faculty. It is almost impossible for the reader to assume there isn’t another side to the story. That a state, even during prosperous economic times, could make such conscious decisions to diminish the importance of higher education—especially in today’s society in which rigor, college readiness, and access to post-secondary opportunities is of paramount importance to sustain a viable middle class. The book probably does not have a lot of widespread appeal outside of Oregon or the higher education community, but it is still interesting reading. One criticism would be that the information becomes so repetitive that the reader could swear they read the same article 40 pages ago—but perhaps that is the point! Sarasohn describes a state that, should one be considering a move, would appeal to older, childless individuals who are interested in lower property taxes and almost nothing else. An interesting thought to ponder as one watches the Ducks in the BCS Championship game this upcoming January . . .